When I gave you the recipe for Kate’s Fry Bread, I made mention of nagoonberry jam for one topping. Some of you wanted to know what a nagoonberry was, so photo above of is this berry of kings in the wild. It is a secretive little fruit, hiding its light in the deepest, darkest recesses of the forest, usually under air cover of a hundred or so squadrons of mosquitoes. That’s per plant. On occasion, if I’m very, very good, my Cordova cousins will send me a jar of nagoonberry jelly for Christmas. What I’d really like to do is dig up a few plants and see if I can get them to grow in Homer, but anyone with a nagoonberry patch is not only never going to tell you its location, they’d hamstring you before you even got your trowel out. I asked my cousin Deb if she’d send me a photo of a jar for this post, and she said she was sorry but they’d eaten it all. Can’t say I really blame them. Instead, click here to read the nagoonwiki. Many consider it to be one of the tastiest fruits in the world: for instance in Russian its name is the “berry of kings” (княженика). Do you have a recipe for nagoon berry jelly? I don’t, Glenora. Let me ask my cousin Deb. Glenora, Deb says she uses this recipe: http://www.kraftrecipes.com/recipes/surejell-blackberry-jelly-52038.aspx. Hi! If you want to grow a similar berry in your garden, there´s a “new” hybrid between your Nagoonberry (Rubus arcticus ssp. stellatus) and our scandinavian berry Åkerbär (Rubus arcticus), which is similarily treasured by those of us who have a secret patch… (probably identical with the russian one). 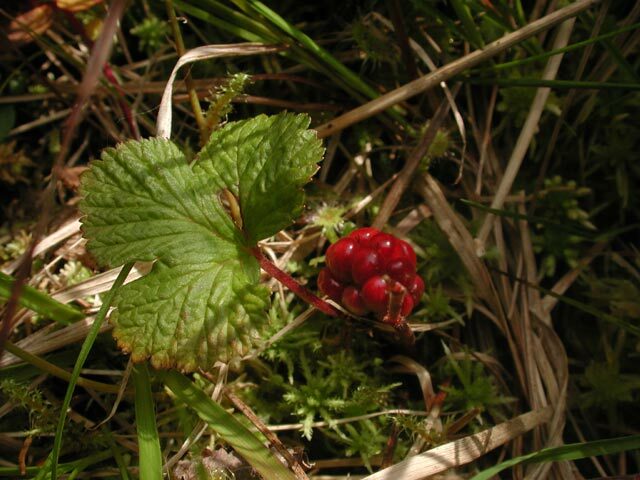 The hybrid is called Allåkerbär (Rubus stellarcticus), and comes in four varieties: ‘Anna’, ‘Sofia’, ‘Beata’ and ‘Linda’. You need at least two different varieties to get berries. The hybrid was created to make it possible to grow them in gardens, impossible with wild plants, at least of our Åkerbär. The tastiest berries I’ve ever tried (though I love mulberries almost just as much)! The hybrid is a bit more sour than our wild variety, but the aroma is the same = beautiful! I grow them on my balcony. They prefer acidic soil, so I’ve also begun to plant them as a ground cover under Rhododendron and conifers (I’m a landscape architect). Love them! Thanks, Karin! I’ll ask my local nursery about it.